A while ago in 2014, I think I may have posted on a strange new website that describes itself as the official website of the Illuminati, the subject of years, decades or conspiracy theory. You can check out their 'official' website here. 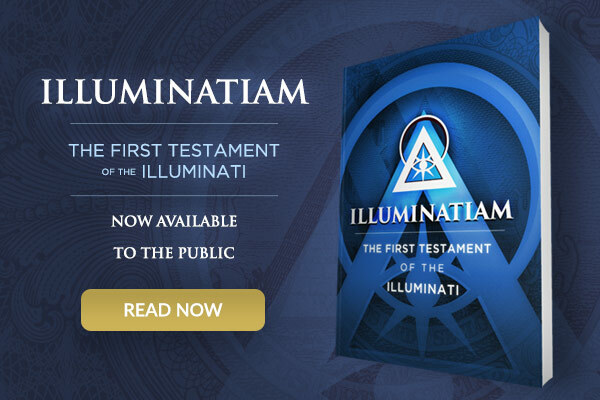 Since then, the official Illuminati website has proven of great interest and bemusement though still remains peripheral. I assumed that the website was a prank, a joke, and so did most people I would imagine. After all, this shadowy sect are not meant to exist. 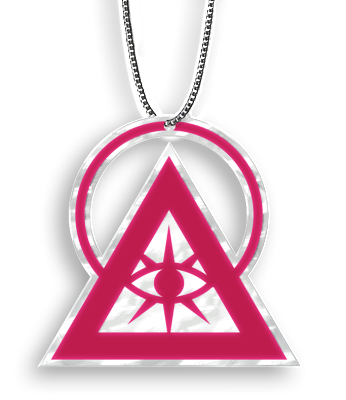 Other onlookers regard it as a scam to get people to buy Illuminati stuff. The organisation is meant to be the creation of conspiracy theorists and tin foil hat wearers. Illuminati emerging out of the shadows? The website spawned a YouTube account, a Facebook account which started on 22nd August 2014 and a Twitter account which now has as many as 31,900 followers. Alas, that is about 30 times the readership of this Catholic blog, but then I'm not offering worldly prosperity and abundance in this world to those who read it, flirt with Satanism, and leave comments. 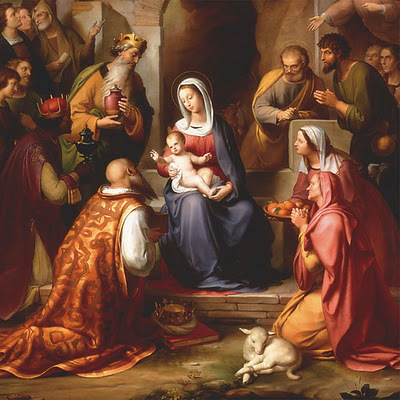 The Twitter account opened on 8th October 2013, that will be the date immediately after the Feast of Our Lady of the Rosary, 7th October. Having recently claimed (has anyone actually seen it?) to have aired their official TV commercial introducing themselves to the US public, they now have an esoteric book of wisdom to sell on Amazon to those interested, as pictured above. All in all, the idea that this Illuminati website is a joke is starting to become less and less amusing, because if it is, it is an awfully elaborate and expensive joke. Knowing full well just how irritated people can become with blog posts that seem vaguely concerned with theories of a conspiratorial kind, I merely wish to report the facts of this website for the record, since should this website and this nefarious organisation gather momentum in this or any other year, it will be worth recalling. As I say, this could all be a perfectly silly and elaborate joke that has taken in quite a few people or even a clever marketing scam to get 'citizens of planet Earth' to buy loads of useless stuff. I also hope that, if it is not a joke or scam and the Illuminati are serious in 'going public' and beginning a recruitment drive luring the masses into the occult and Satanism, that there is absolutely no connection between them and the Vatican, because, if there was, we Catholics, and others, would be in for some seriously difficult times, as if times were not tricky enough. Yes, it's a joke. 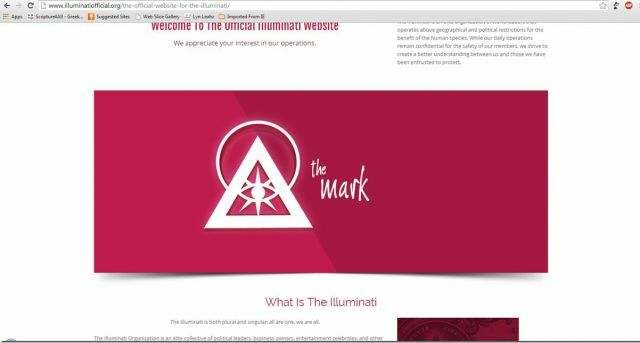 The Illuminati - a group that apparently controls most of the world - would have a better website than that. I always respect your views on the RCC but, to be blunt, always find your conspiracy theory stuff daft (sorry!). Funny bunch this Illuminati....They run the world and wield an incalculable power, but they always have to influence people's minds through slow-burning and hugely costly campaigns. Take climate change. They have been paying thousands upon thousands of scientists for years to demonstrate man-made climate change is a fact, while the oil companies (who are surely also part of the Illuminati) have been simultaneously paying scientists to argue against man-made climate change. Conspiracy theorists claim they have run a 30 year media campaign to influence people and make them believe the climate is changing. But wait..... your average Joe doesn't understand the first thing about complex climate science, so why do the Illuminati need to make the climate change lie so elaborate? And if they're so powerful, why are they bothering to persuade people at all? I mean, the Nazis and Communists used propaganda, but they also didn't hesitate to dispose of anyone who was not convinced. Why hasn't Alex Jones been taken out yet? Why do nearly half of elected politicians in the Senate publicly say they think climate change is all a lie? How weak is this Illuminati that you're all scared of? More troubling(for a Catholic) is that you allege the pope might be part of the Illuminati/New World Order. What exactly is the evidence you've got here? Was Benedict a mason? A lot of people alleged he was, but you never gave it any credence. As far as I can see the reason you will believe one claim while dismissing the other is simply that you agree with one pope and not the other. But remember, the point of the Catholic Church is not to have your own views validated by the pope all the time. They are the shepherd, we are the sheep. Besides, if someone says something you don't agree with you can legitimately disagree with them. It seems like the only response in your arsenal is to cry witchcraft (masonry). It is true that thousands of Catholics are facing disruption to their lives as a result of climate change. Unfortunately, these are already among the poorest Catholics. Whether or not industrial emissions etc are causing that disruption is perhaps a moot point, but is taking a punt on the scientific consensus in order to protect the lives and homes of millions of people really a sign that one belongs to the masons? And finally, in case you haven't worked it out: Alex Jones is a fraud. He owns a media network and advertises products. He's a businessman, not a newsman. Almost every single article on his website is a news story taken off AP with a commentary woven into it that fits the conspiracy hobby horse and keeps his readers happy. Given that all the facts (i.e. the actual story rather than the interpretation) comes from the mainstream media I fail to see how he is reporting on things the MSM don't report on!! My point precisely. The evidence is something you have invented on the spot to justify why there could possibly exist a pope with the temerity to disagree with you. Benedict didn't get fired, he quit. There is no evidence he was fired, and if he was then surely he is equally culpable for being spineless and publicly declaring that he had decided to quit in order to protect the masons who fired him. It's such a dangerous game for a Catholic to play. You'll end up siding with Luther. He did exactly the same thing. The pope says X, I find X repellant, therefore the pope must be the antichrist and not worth following. You're practically saying the same thing. I'd advise caution. Remember, the true test of a faithful Catholic is how far you are prepared to accept a pope you DON'T like. Anyone can agree with someone who shares their views, but that's hardly fidelity. With all due respect, I don't think to be a faithful catholic, I'm only an observer reading some news up and there, I got my own opinion, maybe none shares it with me, but as far as I know, there are many things maybe you don't know because you live far from Vatican and Europe, I think things will be more and more clear after next October synod, let's wait and see. Best regards God bless+. It's called dialectic. Or controlled opposition. You set up two opposing camps, each of which are under your command, and use the push-and-pull between them to guide the debate to the solution you had intended from the start. This is why their is a Labour Friends of Israel and a Conservative Friends of Israel. And because of the huge, ridiculously huge, amount of money these two lobby groups give to each party, it means that whichever party is in power, it will always have to put Israel first. It was interesting to read a biography of Pope Francis called Pope Francis Untying the Knots by Paul Vallely It goes into some uncomfortable revelations about Fr. Bergoglio during Argentina's Dirty War. Everyone that is wanting to know more about his background should read this book. By the end of the book, the author is very complimentary of Pope Francis. @ Anonymous: Agreed. I am not close to the Vatican. But how many Catholics are? As far as I am aware, having an inside knowledge of the machinations of the Holy City is not a prerequisite for having a belief that Christ will not allow His church to err. re. the masonism you allege....Well, I hope you're wrong and that such forces are not at work in the Vatican, but I would be willing to read/listen to anything that suggests you are right. I donot dismiss such ideas as heretical a priori, but I have found that the 'evidence' is always weak (e.g. "a 'source' close to the Vatican said that "mysterious forces" were gathering"). It's the type of 'proof' that is only taken as evidence by those who have already made their minds up to pour scorn on the Holy Father. These very same people, more often than not, viewed the office of the HF as unimpeachable only three years ago. Something fishy with these people, no? @Andrew: Not sure that works as an analogy. I know analogies don't have to be exact, but this one is misleading. Left/Right pro-national lobbies both share a common objective (promoting the nation) but disagree over how best to protect the nation's interests. Left/Right friends of Israel don't dispute whether or not the state exists or should exist, just how best to serve it. This contrasts with pro- and anti- climate change groups, which don't share the common objective of 'promoting the climate' at all. Rather, they disagree as to whether the phenomenon of climate change exists in the first place. If you're right about the dialectic then the following statement ought to be correct: the Catholic church was ALWAYS part of the masonic conspiracy on population control because the anti-abortion stance of the church was part of the pro-/anti- abortion dialectic. "And because of the huge, ridiculously huge, amount of money these two lobby groups give to each party, it means that whichever party is in power, it will always have to put abortion first." P.s., Lawrence - i don't want to turn this post into an argument thread, but can you maybe outline the best evidence you have (in terms of hard facts, not hear-say opinions) on the masonisation of the RCC? If you're right then we all ought to know! If you're wrong then you ought to be corrected. This type of stuff matters to Catholics. You can't be a Catholic and a fruitcake if being a fruitcake corrupts Catholic principles. @Thomas Herd - the true test of a Catholic is not in accepting the opinions of a Pope whether he likes him or not, it is in adhering to those unalterable truths handed down to us. Dear Thomas Herd, I lived in Rome and I know many many things I actually cannot talk about, but I can assure you that the situation is even worse than you can ever imagine, I surely would write many things supporting some theories, if I only could, don't ask me more. No, I don't think that Christ will allow His Church to err, His Church, not this church. Best regards. God bless. For most of us it is impossible to know whether there is a masonic or any other kind of conspiracy within the Church. The important thing is know the teaching of the Church and to consistently refute any deviation from that teaching by reasoned argument. This is likely to be much more effective than making allegations about conspiracies which may or may not be true but which one cannot prove and therefore are less likely to persuade anyone. However this does not mean that one should not denounce the errors of freemasonry, modernism and any other heresy when these are promulgated.